This month, we’ve reached the third stage of our Sales GROWTH Framework – ‘O is for Optimising Sales Opportunities’. This is about making sure that you have all bases covered in the drive for sales growth. Let’s have a look at optimising the opportunities that are right under your nose. We hear a lot about the importance of obtaining new customers, but an equally important part that is often neglected is how to maximise sales with your current customers. These two activities work hand in hand to help you bring in new revenue. The question to ask yourself, or your sales team, is “do all your customers know about all of your products or services?” If they did, and they have already bought something from you (whether it’s current or lapsed customers), they may then have a need for some of your other services, either right now or in the future. I run a sales training programme for a client, and it turns out to be really successful. This means they are much more likely to be interested in other programmes I offer, perhaps my sales leadership or team development programme, or even my sales manager mentoring. But the crucial point here is that if I haven’t told them about it, then they may well not know that this is available, and they might go elsewhere. And it’s happened to me before when I neglected to tell a client about what else I could do to help them: they said, “If I’d known, I would have asked you”. It’s a lesson that can be applied to any business. The statistics back this up. Retaining current customers is 6 to 7 times less costly than acquiring new ones and, equally importantly, repeat customers spend on average 67% more (Source: Bain & Company). 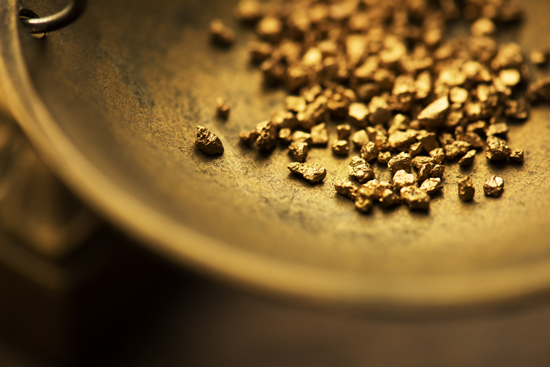 The saying goes that a loyal customer is worth their weight in gold, and considering the high price of gold these days, your business really can’t afford to neglect it. Here is a simple exercise that I learned many years ago via Peter Johnson, a fellow business consultant. 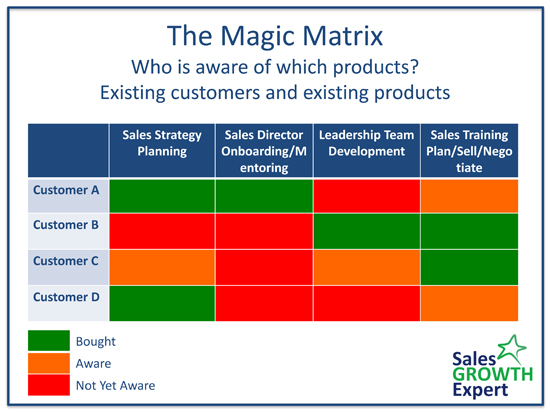 Let’s look at the ‘Magic Matrix‘. It’s just a simple table but it highlights, really quickly, the customers and products that are opportunities for you. It might well throw up possibilities you never knew existed! List your customers down the left hand side, and all your products or services across the top. You then tick or cross the boxes, to show which customer knows about what. You can also use a key to show who has bought what. The question is not if you should be selling more to your accounts, it’s how to keep in touch, and introduce them to your wider products or services. 1. Select the right accounts: Not all customers are created equal: some of your customers – whether they’re bigger, in a certain industry or location, have a stronger relationship with you, or are just more open to new ideas – have greater opportunity for growth. The first step in optimising your sales opportunities should include targeting those customers with the greatest potential. and then developing a specific plan for each of them. A scatter gun approach won’t really work. 2. Know your customer’s direction: I’m not just talking about the part of the business you’re involved with, but their entire business. What are their objectives for the year? 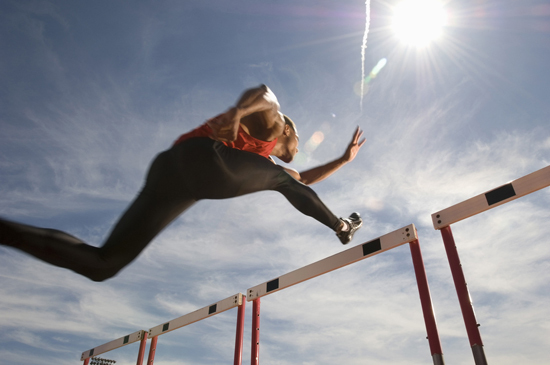 What are the big hurdles they’re trying to overcome? What are their goals? Who are the key players? Sales managers will often say to me, “We know our customer’s business really well.” But if you dig a but deeper, they often have a long way to go when it comes to strategy. One of my favourite exercises in training, is to ask sales people to grab their phone or laptop, and see who can find three new insights for a customer, by Googling! They always can! If you can uncover your customer’s priorities, you’ll have a much better understanding of where and how you can add value – and the areas in which they are willing to invest more. Simply by having conversations about the bigger picture, you’re likely to uncover opportunities where you can help. 3. Have a plan: Growing your sales takes time and resources. You can’t expect to call a customer, and have them sign on the dotted line. Serious sales growth requires a well thought-out plan that’s tailored to each of your customers. Setting out your targeted plans for each of your customers is part of your overall goal-setting for your business. Take a look at my blog from January for more insight into setting – Goals for Growth. 4. Be proactive: I can’t tell you how many I’ve heard the story from a customer about how a competitor swooped in right under their nose, taking business that they were well equipped for. Its remarkable, and was a huge lesson to me, that, when asked, it turned out that the customer simply didn’t know that they offered that particular product or service. The best targets to market to are your own customers. You cannot over-communicate with your customers around the problems and opportunities that you can help them with. Make sure you’re your marketing campaign fuels your sales pipeline, with targeted campaigns that bring value to your existing, as well as new, customers. 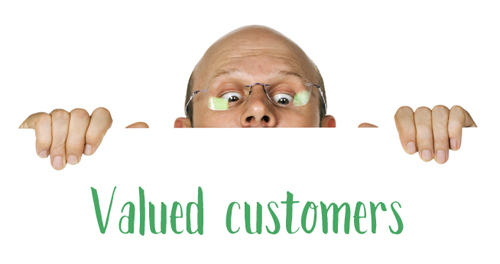 With existing customers, it really is all about creating a smooth and consistent, marketing and sales message. Read my blog on Smarketing for more on this. 5. Know the full range of products and services you offer: This may sound far too obvious a point. You know what you offer, don’t you? Or do you really? Too often individual sales professionals know too little about their company’s full set of products and services that they’re unable to uncover the needs of their customers. If you are the business owner, it can be even more of a challenge. I work so often with people who kind of make it up as they go along. These are the people who find selling difficult. I don’t mean that you need to be totally rigid in the products and services you offer. But you do need to know the triggers, and the right questions to ask, to uncover needs in the areas where your company can help. Once you’ve done this, you can always bring in a colleague who specialises in this area. But it’s up to you to uncover the need and to be able to speak enough about it to pique the customer’s interest. 6. Get a process in place: Being successful with growing a sales opportunity requires an effective process. If you don’t have a process in place for growing your customer accounts, you’re leaving it to chance and you won’t then be able to maximise the majority of opportunities that come your way. Having an effective sales management process is a challenge that all businesses face but poor performing companies are more likely to complain about a lack of a proper process than their more successful competitors. The important point to remember here is that sales opportunities can be found right under your nose by offering your products or services to customers you already know: all you need to work out is a way of keeping people informed. Look out for stage 4 of the Sales GROWTH Framework next month, where I focus on the optimal Ways of Working for your growing business.